Whether you live in a hot and humid climate or a cold one, a fireplace is always a welcome sight. There really is nothing like coming home after a long day and gathering around a fireplace with family and friends. A fireplace is a brilliant statement item for a home, as well as a practical way to heat one's abode. 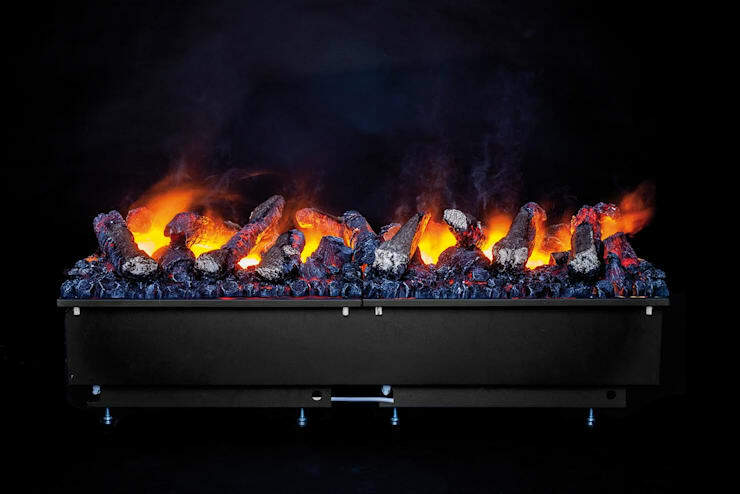 The warmth and subtle glow of flames slowly licking the side of a charred log is a truly unforgettable experience, and can enhance a dwelling with relative ease. Now, a fireplace isn't just about heating, it is a symbolic statement piece for your home that will satisfy a desire for warmth and the calming glow of a burning fire. Whether you choose to install your fireplace in a bedroom, bathroom, or more commonly, a living room, you can be sure it will look fantastic and feel just as splendid. But how does one go about choosing elements and a style for this new domestic accessory? These days there are almost countless designs and options available, making a new fireplace appear a somewhat daunting and challenging stylistic decision. Luckily, homify is here to help! 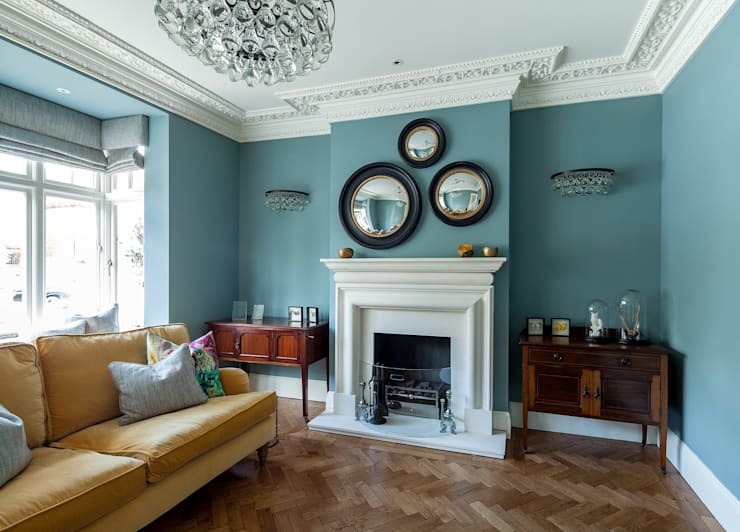 Take a peek at the examples below, and get a few handy hints to update and upgrade the ambience of your most important investment; your home. First things first you are going to want to choose a style of fireplace. As this is one of the crucial points that can determine the overall success of your room, you may want to consult an interior designer or professional. Fireplace styles vary considerably, from simple traditional designs that you might have seen growing up, to new age and futuristic features. The style of your fireplace will affect the other design elements within your space, so remember to thoughtfully choose your new item, or you may find you need to completely redecorate! Masonry. These include brick or stone fireplaces and chimneys. Metal-lined flue. These are generally double walled metal pipes that run up inside the existing fireplace canal. Contemporary. This is a broad term used for many of the new fireplaces that are on the market today. They include suspended gas burning fireplaces, and other unique designs. 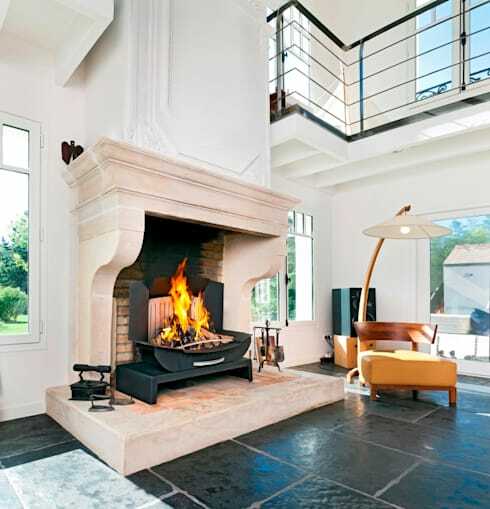 In this example we are given a glimpse of a truly inventive fireplace design. Not your typical wood burner, this striking metal fireplace is a statement for the room it sits within, and looks delightfully individual. The opening is a vertical rectangular shape, offering full view of the tall flames as they crackle and burn. Size is extremely important when you consider your new fireplace. You want to ensure it is functional and can adequately heat your home. 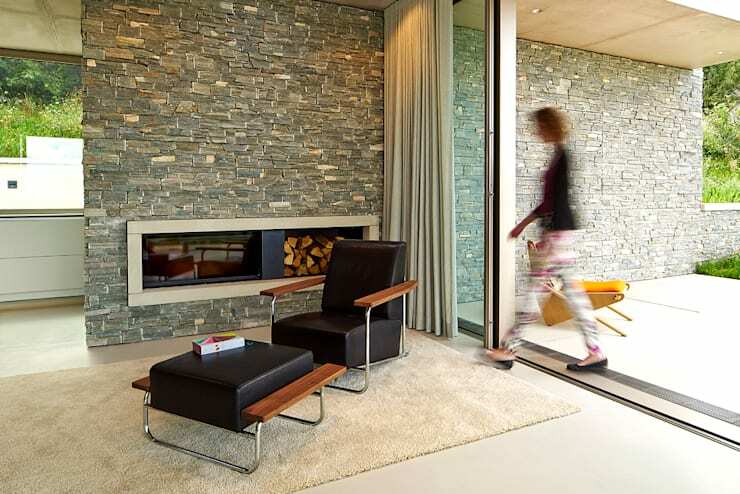 However, if it is a fireplace designed as a standout feature rather than a practical addition, it might be far smaller. Consider the room, is it a bedroom, bathroom, living room? etc. and pick your fireplace accordingly. Take some measurements of your home, and ensure you pick something that will look stylishly in-keeping with the design and layout of your dwelling. Natural gas is a popular choice for many homeowners. Safe and easy to look after, a gas burner can also come in a range of different styles and designs. Although they don't quite have the charm of a real wood fire, they can be purchased with an option of faux timber, or coal, potentially adding to their appeal. They are functional. Simply push a button and on they go. No messing about with firewood, kindling, matches and fireplace guards, they are convenient and mess free. Gas is also reasonably cheap compared with the price of burning timber, and additionally does not require regular chimney sweeps. How about a wood fire? If you are thinking about a wood fire, there are a few things to consider. Firstly, there are environmental concerns. Wood burning fireplaces emit approximately 13 kg of particle emissions per BTU/hour (thermal unit per hour) of heat output (soot and ash) as opposed to natural gas which produces up to 99% less (about .127 kg/1 BTU). To generalise, burning wood in a fire is less environmentally friendly than their gas counterparts. Secondly, you need to have a constant supply of burnable wood. If you live in the city, this can be much harder than those who may reside in the countryside, where firewood is plentiful. As a third point, cleaning is a major consideration. Chimneys require regular attention, and can become a hazard if not regularly attended to. All things considered, wood burning fireplaces still retain that charm and character than gas cannot quite develop. They crackle and change, are cosy, snug, and provide something to watch as much as a warm place to gather. The surround is extremely important when choosing your new fireplace. These days there exists a plethora of different designs, ensuring a range of options to suit virtually any home. Wood. 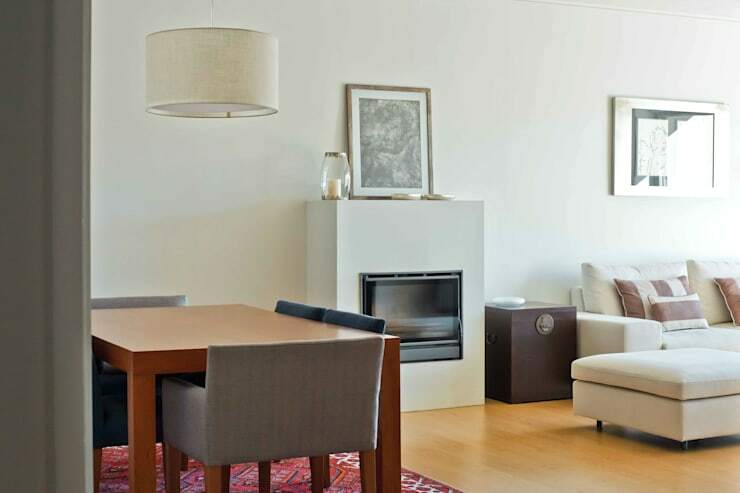 Timber fireplaces are extremely popular and have been employed for centuries. Easy to clean, requiring regular polishing, wood is a long-lasting and age-defiant choice. Stone. Stone evokes an urban rustic ambience, and is an extremely popular style for many home. Different stone types may include limestone, marble, slate, travertine or granite. Stone is will discolour and change over time, but is hard-wearing, and conversely quite high maintenance. As stone is natural, many crevices and cracks can trap dirt, making it difficult to clean. Additionally, you should consider buying additional stone to fix repairs should they arise. Textured stone or plaster. If you are looking for low-maintenance then this is the solution for you. Plaster is simply a continuation of the wall within the room, and an example can be seen in the image above. Textured stone is a composite that is highly fire retardant, and low-maintenance. Durable and long-lasting, this is a safe and popular material. Brick. Brick is a common design for traditional homes and bungalows. As a sturdy material, brick is low-maintenance, and insulates heat extremely well. Marble and limestone. Next up, we have the more luxurious materials available. Marble is commonly seen in large historic mansions, villas, and also fashionable contemporary dwellings. Often exuding a sense of class and refinement, marble and limestone are chosen for their formal aesthetic. Remember to seal these fireplaces, as they can become prone to scratches. Stainless steel. Stainless steel is essentially a modern choice for a contemporary home. Easy clean, this surround will be sure to attract attention. Tiles. Tiles are less commonly used, but can provide a range of styles and designs that other materials cannot. Concrete. Concrete is inherently industrial and cool. Fashionable, and able to be adapted to many different styles and shapes, concrete is becoming increasingly popular in modern homes. Finally, we have the accessories. Depending on the style of your home, you will want to accessorise your space to enhance your fabulous fireplace. Think mirrors, lighting, candles and curios to bring life to this central gathering point. In this example we see a fabulous room that works with symmetry to create a stylish and enviable space. Mirrors reflect the light and open up the space, while the matching wall mounted lights are warm and inviting. Do you own a fireplace, or are you thinking of installing one? We'd love to hear your thoughts in the comments section below!